Please use the Google map, provided below, or go to Google maps; type in Laurel Caverns, and choose “A” as the final destination. 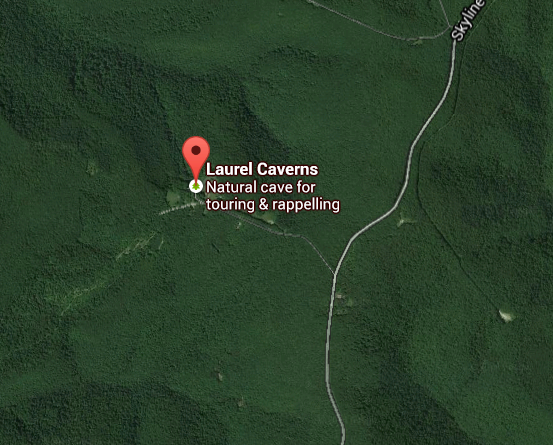 Or, if you use yahoo maps, please type in: 200 Caverns Park Rd, Farmington, Pa as the destination. Laurel Caverns is atop Chestnut Ridge surrounded by thousands of acres of publicly owned forest lands. Laurel Caverns is in the middle of a four mile by five mile forested area with only one good paved road and dozens of township owned dirt “roads,” some of which, for good reason, are no longer maintained. Some are little more than trails and some are even gas lines. But because they are publicly owned rights-of-ways they are on “official” maps as roads and GPS and on-line map services are using them, assuming every publicly owned “road” is actually a road. If your GPS is directing you to a dirt road or gravel parking area, you are lost. All proper roads to Laurel Caverns are paved. Use common sense; follow our signs, not your GPS. 2. DO NOT USE OUR PHONE NUMBER OR OUR POST OFFICE ADDRESS. 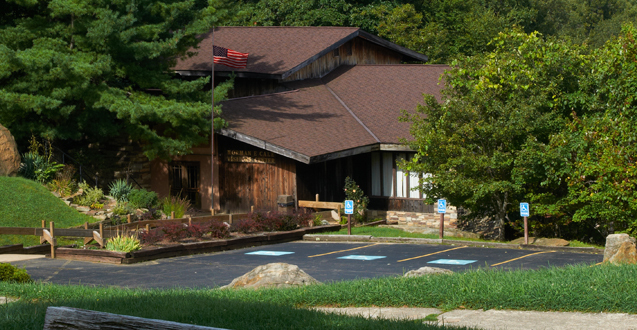 Our 911 address is 200 Caverns Park Drive, Farmington, PA 15437. But we are 11 miles from Farmington and the Summit Inn’s address, 101 Skyline Drive, Farmington, PA, 15437 might work better. However…If your GPS is directing you to a town or residential area you are lost. 3. IF THIS PROBLEM OCCURS USE GPS ONLY AS FAR AS EITHER HOPWOOD PA OR CHALK HILL PA, THEN FOLLOW THE DIRECTIONS BELOW. The Laurel Caverns Road (called Skyline Drive) is five miles long and begins on US Route 40 at the Historic Summit Inn, two miles west of Chalk Hill PA and three miles east of Hopwood PA (Fayette County). There are no addresses between Hopwood and Chalk Hill because that part of the four-lane Rt. 40 is all forest. From Chalk Hill take Route 40 WEST for two miles to just before the crest of the Summit Mountain. (Get in the left turn lane as you approach the flashing yellow light at the crest of the ridge.) Turn left just before the entrance to the Historic Summit Inn, on to Skyline Drive. Follow Skyline Drive south for five miles. 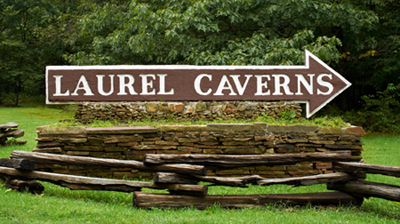 The Laurel Caverns entrance will be on your right. (The only paved “fork” is Kirby Road. A sign there tells you to bear straight and to the right, not taking Kirby Road. 4. ALLOW PLENTY OF TIME FOR YOUR TRIP. If you have any Problems or questions, please call us at 724-438-3003. Thank you.